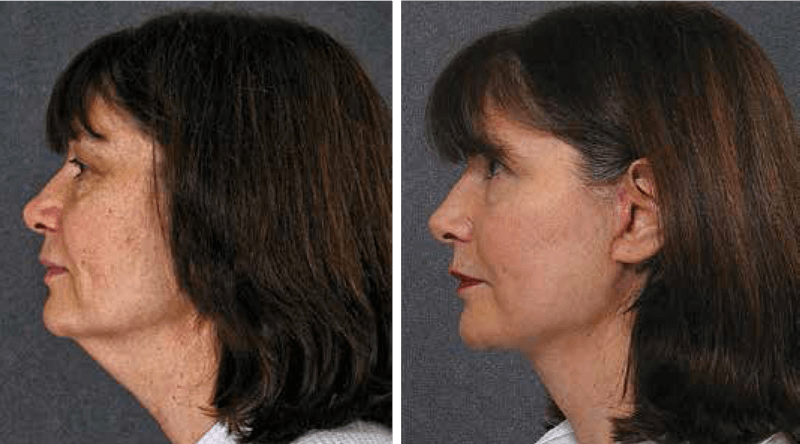 When I discuss facelifting with other leading plastic surgeons, we all agree that the neck is the most important aspect to be addressed when performing a “face lift”.Our results above the neck have been quite satisfactory; however, in the neck below the jawline the results have not stood the test of time. We quite commonly see tight faces and loose necks, giving the very obvious stigma of a face lift. There are a plethora of minor techniques, injectibles, muscle modulators and threads that have come and gone over the last 20 years in an attempt to reverse the normal ageing of patients in their late 40’s, 50s and 60s. Sagging is the major contributor to ageing, as well as the loss of elasticity of the skin, the accumulation of fat or the loss of fat and the reabsorption of bone, which all contribute to the appearance of an ageing face. as the patient ages, it is easy to identify whether or not there is sagging: no makeup can make a difference here. and the platysma muscle within the training of French surgeons led them to develop new techniques which were superior to the previous ones of neck suspension. mobilised this muscle so that it gave it firmness underneath the jaw and also to the mid part and lower part of the neck. These techniques I have been fortunate to develop and publish as articles in journals and chapters in textbooks. At the ICAPS (International Consortium of Aesthetic Plastic Surgeons) meeting in the Netherlands this year I had the privilege of demonstrating this unique technique in the Rotterdam University Anatomy Laboratory to my distinguished colleagues from all over the world. I believe that they understood the significance of detachment, elevation and permanent fixation and that this was different from what they were doing previously. I give full credit to Alain Fogli from Marseille in France for stimulating me to further develop his technique and he has recently given me great credit for expanding his original concept. group of surgeons from all the Scandinavian countries including Sweden, Norway, Finland, Denmark and Iceland. The first paper I delivered was my experience of breast augmentation with deformities of the chest wall such as women with scoliosis and or bony or concave/convex chest walls. Often different sized implants, solid chest wall implants and fat injections need to be used in combination to achieve a good result. which is known to be present in at least two percent of our population and in greater than ten percent of all patients who seek cosmetic surgical treatment in our society. These patients suffer from exaggerated anxiety and depression about relatively minor physical problems be they real or perceived and cannot be helped by any elective surgical procedure. They need mental health care referral and any surgery must be deferred until they have been both treated and cleared by a mental health care professional. covering the topic of facelifting and specifically addressing the ageing and laxity in the neck as an aesthetic area that must be addressed in combination with the other areas of the face. The benefit not only to participants but to the faculty and invited speakers of these conferences is to deal not only with the improvement of our surgical results but to share our experiences and information about industry changes and emerging issues such as the rise of BDD and issues such as the recent serious issues associated with textured implants. Dr Hodgkinson carries out all his cosmetic and plastic surgery at the Double Bay Day Surgery (DBDS) which opened its doors as a fully licensed and accredited day surgery hospital twenty years ago and has maintained this important status ever since. brought to light that many operators continue to flout the law in pursuit of profits. This tragedy in the wake of other publicised news of patients’ lives being put at risk highlights the importance of cosmetic surgery being taken seriously as real surgery which should only be carried out in licensed surgical facilities by experienced practitioners. It has also been shown that private hospitals which specialise in elective cosmetic surgery have lower infection and complication rates in general than larger facilities which have a broader case mix. and technological infrastructure are rarely met in such general environments. support are accompanied by one of our private nurses who are expert in plastic surgical care. It may seem unfathomable that despite legislation and standards some operators are willing to risk the safety of the public in pursuit of the dollar. So, despite new laws, it is still buyer beware. Make sure any facility you use is licensed and accredited and has a long standing track record of safety and quality. A major topic at the recent Swedish meeting by invited experts both from the surgical fraternity and international implant companies was the serious findings emerging about a very rare but real malignancy resulting from textured shell breast implants: anaplastic large cell lymphoma (ALCL). aspirated by a radiologist but must be sent to pathology for specialised tests to detect the malignancy. Fortunately, I have always been suspicious about the validity of textured implants and only use smooth walled breast implants. No implant, not unlike any body structure, is perfect but smooth walled and saline filled implants fulfil all known criteria for safety first in breast implants. This year saw the most ambitious and successful surgical initiatives by Operation Restore Hope (ORH) in the Philippines in our nearly twenty five years of working there. A new hospital in an area of need in Manila, Las Piñas, offered ORH a ten year commitment to integrate our unique cleft lip and palate surgical program into their community. What makes this program unique is the partnerships that the charity has been able to secure given its responsible track record surgically, organisationally and fiscally. ORH has never been a fly in and out charity but takes responsibility for the ongoing care of its patients. This is only possible with the coordination and cooperation of our Filipino counterparts. The Filipino surgeons are talented and committed but lack the resources to deal with the immensity of the problems in their communities. service award at the Embassy of the Philippines in Canberra this year in celebration of 70 years of Philippines Australian diplomatic relations.